Whether you are updating your healthcare facility or restoring your hospital after a natural disaster, construction projects in healthcare environments require specific skills and knowledge for safe and successful execution. When performing construction or restoration work in a hospital or other medical facility, precautions must be taken to prevent the spread of infectious diseases and to protect critical hospital utilities from damage. The Centers for Disease Control and Prevention (CDC) estimates that about one in every 31 hospital patients has a healthcare-associated infection (HIA) on any given day. Hospital construction projects can increase the risk of HIAs and other disease outbreaks if not managed properly. However, by performing infection control risk assessments and implementing the recommended control measures, contractors can reduce the risk of an outbreak during construction or renovation. A contractor certified to work in a healthcare environment will have the knowledge and experience necessary to keep your patients, staff and visitors safe. Is Your Contractor Properly Certified to Work in a Healthcare Environment? Choosing a contractor certified to work in a healthcare environment is critical to keeping patients and workers safe. If a contractor does not implement the proper disease control techniques during a construction or renovation project, infectious diseases could spread to patients or there could be other unnecessary hazards created. Mistakes in a hospital renovation project can be expensive. If materials are compromised with bacteria or mold spores, previous work may need to be torn out and replaced, leading to costly project setbacks. You might not know whether your renovation contractor is certified to work in a healthcare environment, but you should. Construction project management in a healthcare environment presents unique challenges that are best addressed by a contractor with the right experience and training. Here are a few challenges healthcare construction companies face when working in hospitals and other medical facilities. Continuous operation: Hospitals operating 24/7 cannot be closed down during renovation projects. Contractors must take extra care to not create noise or vibrations that disturb patients or to allow any dust, dirt or bacteria to spread to patient areas. Disruptions to electricity can cause failure or malfunction of critical medical equipment. Increased fire risk: Many hospital patients cannot exit the building on their own in the event of a fire, so proper fire-rated materials must be used in restoration or construction projects. Air contamination risk: Contamination from airborne spores is one of the most serious risks of hospital renovation projects. When removing old materials, fungal spores or bacteria could be released into the air. If airborne bacteria is not contained within the renovation zone, it can cause infections. Water contamination risk: When working with plumbing in a healthcare environment, contractors risk water contamination during periods of water stagnation. This bacterial growth can lead to unwanted infections. A certified contractor will not only have experience with the unique challenges of working in a healthcare setting but also the skills necessary to implement proper disease control measures. The CDC offers Guidelines for Environmental Infection Control in Healthcare Facilities, including best practices for construction, renovation and demolition. A certified contractor will adhere to these procedures to ensure workers, patients and staff are kept safe during the construction project. Before the project begins, a certified contractor will work with healthcare administrators to perform a risk assessment and plan for airflow control during the construction project. The contractor and hospital staff will plan for monitoring and documenting the air quality and negative airflow in the construction area. The risk assessment should include a plan for diverting pedestrian traffic away from the construction site so dust is not spread through the facility. This includes designating a separate entrance for the construction crew and planning for safe equipment transport. Depending on the location of the construction zone, it may also be necessary to relocate some patients temporarily. These arrangements should be made before the start of construction. Erect construction barriers: To prevent dust and bacteria from exiting the construction area, contractors will place barriers around the construction zone. These barriers must be in compliance with fire codes and be impermeable to bacteria and fungal spores. Use a negative pressure system and air filter: To ensure contaminated air does not leave the construction zone, a negative pressure system can be implemented. An industrial HEPA filter should also be used in the construction zone. Seal and block air vents: If construction work is being performed outside a healthcare facility, air vents near the construction site should be sealed. If the facility cannot operate on recirculated air, the air filters should be changed frequently to prevent dust build-up. Avoid damage to water system: Damage to plumbing can cause water contamination. The contractor will take care when working near underground water systems to prevent damage and avoid water stagnation as much as possible. Monitor for airborne bacteria: During construction, contractors should perform air quality testing to check for airborne bacteria and fungal spores and keep air quality records throughout the project. HVAC filters should be checked periodically and changed if they are dirty or clogged. Monitor barrier integrity: The contractor will monitor the construction barriers to ensure that negative air pressure is maintained and the barriers are physically intact. Any gaps in barrier seams should be fixed immediately. When the construction project is complete, a certified contractor will follow the proper cleaning procedures in order to meet the facility’s requirements. When removing construction barriers, the contractor will take care to prevent dust and debris from exiting the work zone. Air filters will be cleaned and replaced before the room is restored to the appropriate pressure and humidity. From the beginning to the end of the construction project, certified construction companies for healthcare facilities will take every precaution to meet applicable guidelines, whether CDC or otherwise, and keep both patients and workers safe. During a hospital or other healthcare construction project, the project manager is responsible for performing a risk assessment before the project starts and monitoring compliance during construction. While planning for safety is essential for any construction or renovation project, it is especially crucial in a healthcare environment. The construction project manager will work with the hospital or office staff to create a thorough and comprehensive infection-control risk assessment (ICRA) before any work begins, if justified by the project’s scope or requested by the customer. Determine the construction type: The project manager will identify any tasks that might generate dust, dirt or bacteria or risk contaminating the water system. Identify affected patient risk groups: The hospital staff will then determine the risk level of patients residing near the construction zone. These patients will be categorized from lowest to highest risk, depending on their treatments or condition. Determine the infection control classification: Using the ICRA matrix, the construction project will be given a classification of project type based on the construction type and patient risk. 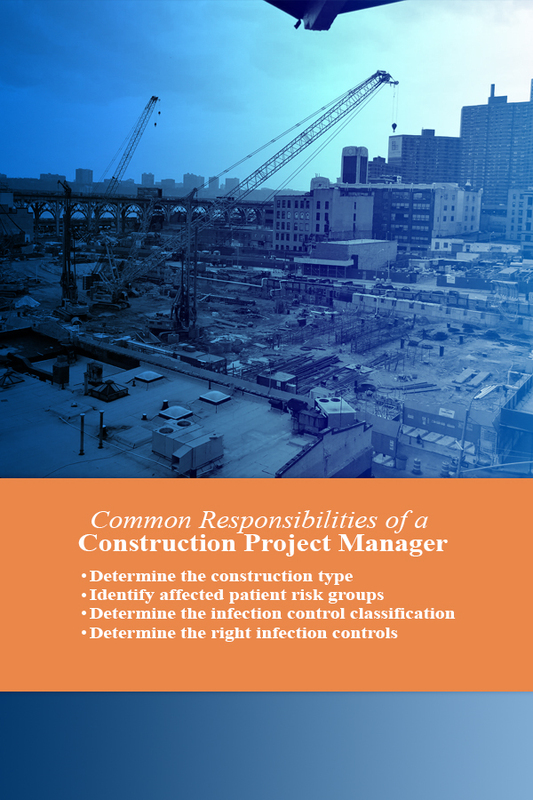 Determine the right infection controls: Each construction project class requires a different level of controls to prevent the spread of infectious disease. The project manager will identify and implement these controls based on the project classification. The written ICRA could include plans for controlling airflow, preventing water system damage, relocating patients, redirecting pedestrian traffic and any other necessary preventive steps. The risk assessment should take into account any noise or vibration produced during construction that could disturb patients. Once the risk assessment is performed and finalized, the construction project can begin. During construction, the project manager will continually monitor worker compliance with best practices and safety regulations and ensure ICRA requirements are met. Effective construction project management in healthcare environments includes performing air quality testing and monitoring barrier integrity, as well as monitoring for any unanticipated risks and addressing them immediately should they arise. During construction and renovation projects in healthcare environments, infectious disease control is of the utmost importance. One of the biggest risks for an outbreak during hospital renovations is airborne bacteria and spores. During demolition tasks, latent mold spores in the walls or ceilings may be disturbed and released when materials are removed. If these spores are not contained in the construction zone and eliminated before barriers are removed, they can cause infections in immunocompromised patients. Disaster Kleenup International (DKI) is a disaster restoration contracting organization that provides contractors with the necessary training to perform effective infectious disease control during construction and renovation projects. All members of DKI receive up-to-date training on infectious disease control and are equipped to provide effective disinfection solutions. This extensive disease control training includes education about infectious diseases, how they spread and the best techniques for infection control. DKI contractors are certified to work in hospitals and other medical facilities and trained to create and implement effective ICRAs. With expertise in air control, disinfection and barrier management, DKI members are prepared for infectious disease control in any healthcare construction or renovation project. When managing contractors in healthcare, it can be difficult to keep track of every construction worker who enters and exits the facility. If your contractor is not certified to work in a healthcare environment, these workers might not be aware of infectious disease risks and other healthcare-related hazards. Your hospital staff cannot train each worker individually, and it is not always possible for a hospital administrator to be present during construction projects. Without proper training, the construction crew could make mistakes that can have serious consequences. When you hire a certified contractor for your hospital construction project, you can expect effective infectious disease control and reduced patient and worker risk. Certified contractors are equipped with the necessary skills to prevent the spread of infection and keep your patients, staff and visitors safe.This means your hospital staff does not need to spend time educating construction workers or monitoring the construction site. The certified construction project manager will provide effective oversight to ensure disease controls are maintained throughout the process. One of the most critical infection controls is to prevent airborne bacteria and mold spores from exiting the construction zone. Contractors certified in mold remediation will be best equipped to prevent the spread of harmful bacteria and fungal spores. A contractor who has received a Mold Remediation Technician (MRT) or Mold Remediation Supervisor (MRS) certification will have the knowledge necessary to implement effective barriers and containment structures to prevent airborne spores from spreading to patient areas. Choose a contractor with experience and certification in the healthcare field. Don’t be afraid to inquire about infectious disease control procedures. Certified construction companies for healthcare facilities can answer your questions with clear and effective solutions for infection control. At Tuckey Restoration, Inc., our contractors are certified to work appropriately in a healthcare environment and provide effective infectious disease control. As an affiliate of DKI, our contractors have received expert training in healthcare construction safety and infection control. Tuckey Restoration also completed a specialized infection control training course through the Linders Health Institute that addressed emerging infectious diseases, infection control, airborne pathogens, waterborne pathogens, MRSA and other exposure risks. Further, our team of contractors includes MRT- and/or MRS-certified technicians with expert knowledge in mold control and remediation to prevent the spread of airborne pathogens during hospital renovation. With this extensive training and years of experience, Tuckey Restoration is a trusted partner for infectious disease control in any healthcare construction or renovation project. Whether you are seeking a healthcare construction company to renovate your facilities or to restore your hospital after property damage has occurred, Tuckey Restoration has the right skills and training to get the job done. When you’re ready to begin your next healthcare restoration project, contact the professionals at Tuckey Restoration.